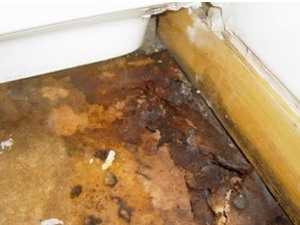 Penetrating damp can have a number of different causes. When above ground level it is usually because of leaking gutters or downpipes, defective flashings, masonry and mortar defects and poor ventilation. Moisture penetrates through walls when left unchecked and even though this may look harmless at first water can be one of the most destructive forces on your property. Even if it does not penetrate all the way through a wall it will often lead to condensation problems, moss growth, increased heat loss, and frost damage into the masonry. Examine gutters, down pipes, flashing, rendering and window frames in detail. If the guttering has seen better days, think about replacing it with new easy-to-fit plastic guttering. Check the rendering to see if it's cracked, plus look at re-sealing any gaps around window frames. Always make sure that down pipes are unobstructed. Check underneath window sills as there should be a drip groove to shed rainwater. 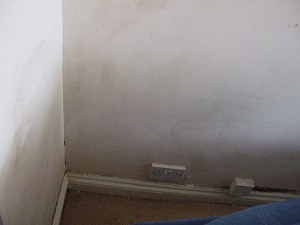 Rising damp is usually found by the signs of a damp line appearing on the inside wall. This is often combined with damage to skirting boards and decoration. 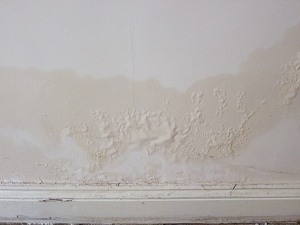 The result of this rising damp is strucural damage to interior render-plaster systems. It should also be noted that recent findings by the asthma foundation concluded that damp rooms can increase the risk of developing asthma. Rising damp occurs when ground water is allowed to rise vertically through walls by capillary action and is caused by the breakdown of, bridging of, or non-existence of a damp proof course (DPC). Thus the dampness is rising through the actual mortar beds rather than through the brickwork itself. When warm air hits a cold surface it turns into water, which in a building we know as condensation. At Hampshire Woodworm we have a number of techniques we can deploy to get rid of this problem, which at its extreme, causes mould and damp. Problems can be reduced or eliminated. Add value to your property using specialist â€˜basement waterproofing techniquesâ€™, we can transform your cellar or basement into habitable accommodation. This can considerably add to the value of your commercial or residential property or properties. 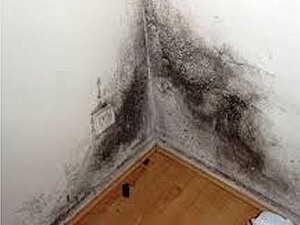 Many buildings contain uninhabitable, mouldy and damp basement walls with no waterproofing protection. Cellar walls, which typically form the foundation of the building, are generally sited underground, beneath the waterproof membrane layer that serves as the buildings damp proof course. Accordingly the wall is constantly subject to conditions favourable to penetrating dampness and water ingress via capillarity and/or hydrostatic pressure. The main type of tanking is referred to as Cementitious Tanking. Cementitious just means that something is like, or pertains to, cement. 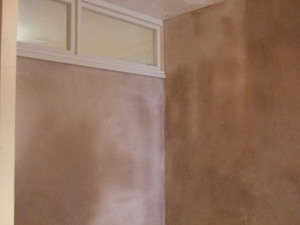 With cementitious tanking the wall of the structure is stripped back to the base material and then re-rendered with several coats of a sand/cement render mixed with special damp proofing products. Cementitious tanking is normally used where the likely ingress of water is considered to be less than something that would require the fitting of a DPM. The advantage of a cementitious tanking system is that it is vapour permeable. As the movement of water vapour is generally outwards from the basement or cellar this allows the room to breathe. This is multi-coat, pore-blocking slurry mix. The tanking slurry contains polymers designed to enhance adhesion to the wall and increase tensile strength. Once applied the tanking is able to withstand external water pressure and maintain a dry environment by creating a physical barrier to water entering the basement area through the walls. Wall ties are an essential element for the stability of a cavity wall structure, tying its weather protecting brick facade to the main body of a building. An effective brick tie system transfers static and live loads across the cavity, enabling load sharing by both inner and outer walls. Typically, cavity wall ties are bedded in a mortar bed joint as a building is constructed. 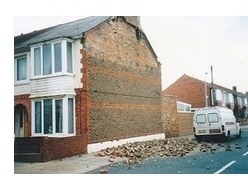 Cavity wall tie failure can be a consequence of a construction defect; for example where the original 'built in' cavity wall ties have been omitted, incorrectly fixed or fitted with brick ties that are too short. 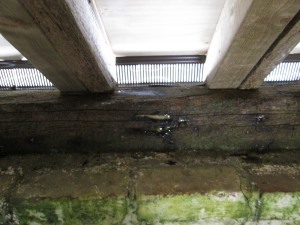 Alternatively, failure may be a result of a buildings aging process, whereby wall tie corrosion may have compromised the walls load sharing capabilities.